Finding food to eat during our Pantry Challenge will not be a problem this month, but getting my childrens’ hands on snacks in a timely manner requires some creative thinking. My favorite popcorn popper EVER, West Bend Electric Popcorn Popper has been on overload nearly every day. I was given a Stir Crazy when I graduated from high school. I was the queen of our dorm because I continually provided yummy snacks for our floor. It has been a tradition ever since. Often, I am asked to bring my special “family secret” popcorn to get togethers…it’s that good! Of course, buttered popcorn is traditionally everyone’s favorite, but I’ve been experimenting. So far I’ve tried three concoctions..Parmesan Cheese and salt, cinnamon and sugar mixture, and Southwestern Seasoning. The Parm has been a winner. Join our family’s movie night tradition and get that popcorn popper stirring. Another great DIY popcorn secret is my homemade microwave popcorn. We got an airpopper a few months back and it’s been seeing a lot of use! I love it =) The Kernel Seasoning flavorings work pretty well, and most of them are good on other things too (which doesn’t help when you’re pantry eating, but for the future maybe). But its almost 1 am, and I should be in bed!! Thanks for the great recipes! We just got a Stir Crazy at Christmas when they were 19.99 at Target. 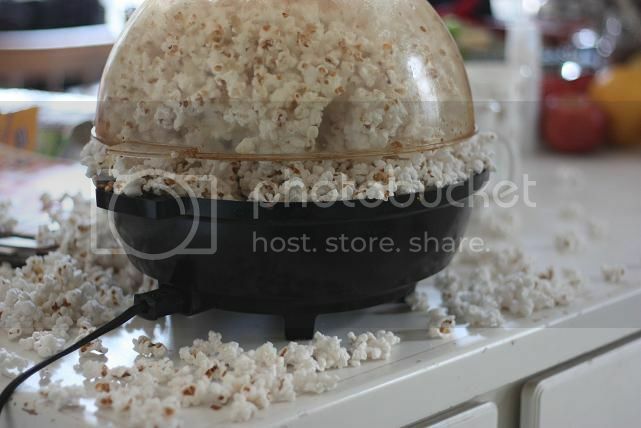 We’ve had a stir crazy popcorn popper for years and absolutely LOVE it!! It really makes the best popcorn. We have been through 5 Stir Crazy’s in 25 years and one year we gave every family member and friends a Stir crazy for Christmas. It is the best!!! Love your new pantry project. I had one of those in college, too! It made the best popcorn and was so very easy to use. Alas, it died before I had children. Now we have a stovetop model that I bought at Yoder’s General Store in Shipshewana, IN, and it makes popcorn just as good as the Stir Crazy. . . but I have to do more of the work myself. But if the Stir Crazy is back–I’ll be on the lookout! This WOULD be a great thing for a kid to take to college–beats microwave popcorn by a mile. White corn, huh? I’ll have to try that. But don’t worry, I won’t tell anyone. Mum’s the word. I have yet to acquire a cool popcorn popper but get rave reviews over making in my big pot on the stove… Thanks for the parm cheese tip… I’ll give it a try tonight for family movie night! and you’re right, WHITE kernels ROCK! Tonight is movie night at our house! I make popcorn on the stove with a large pan. I pop the kernels in organic, cold-pressed, extra virgin coconut oil then season with a sprinkle of Real Salt. The kids like to add in banana chips and raisins. Yummy! I did have an air popper, but I always managed to make a huge mess with it, and with five (and 1/2 of us) we need ALOT at one time. My mom got a popper like the ones at the movies but honestly, she doesn’t like it. I can’t say I was that impressed either. I am horribly unhealthy with my popcorn and it gets served with real butter which she could not do at her house (b/c my step dad was there and would have fussed about it). That might be why I wasn’t impressed. Can you believe that we don’t even own a popcorn machine?! My mom “won” one at a white elephant gift exchange this year. No one tried to steal it from her. BUT, I think she was the real winner of the white elephant party. It was DELICIOUS!!! We love popcorn at our house too! I am fresh out of popcorn…but I finally went shopping this morning. You’d be proud of me Jen, I was so creative using what we had in the pantry. Our holiday guests left on Dec 28th and I felt the need to go shopping then…but didn’t until today. I was shocked that there was actually enough to eat balanced meals this long. Thanks for the push! 🙂 Love popcorn on movie nights, I’ll have to check that popper out, we use microwave (gasp) I know, it’s not economic. I’ll work on it. Have a great weekend. @Jessica @ These Are The Days, YEA – good for you. 🙂 The microwave stuff….I buy it when I have a coupon and it’s on sale, but seriously….no comparison in taste. Your post today sounds like something I could have written, too! ABSOLUTELY nothing better than Stir Crazy – had one in college and used it every night. Received one for a Christmas gift a few years back that got broken when my son helped me dry dishes one night. And I consider my best yard sale find EVER to be the Stir Crazy that I found right after I broke the previous one! I love my Stir Crazy, but always forget to buy the kernals. I’ll definitely be checking out the white corn! And, what a fabulous idea for a gift for my college age bro and sis! I had a stir crazy in college. I loved that thing. And you’re right… white popcorn is so much better. I wonder why? Next time try garlic salt and parmesan. It’s to die for! When I was in college we put lemon pepper on our popcorn and it was wonderful! We love ours – popcorn for pennies is what I always tell the kids! Goes great with a movie checked out from the library! We LOVE our popcorn, too! Everyday at 3:00 we break it out. The kids go nuts when we are out of kernels. our family loves either dry ranch dressing sprinkled on popcorn or my favorite is after it is pop throw a layer on a parchment lined cookie sheet and drizzle white chocolate on it and throw it in the freezer for just a few minutes – sweet and salty – yum!! I just ordered this popcorn machine! Thanks! My son is a complete and total popcornaholic. He eats it nightly. After hearing about “popcorn lung” a while back, I made him stop eating microwave popcorn and bought an air popper. He’s been fine with it, but I’m not a fan. his current machine has started to spark when unplugged, so your post is timely! Yard sale season is almost here, I will have to keep an eye out for one! Thanks for the great tip! We used to have on of those when I was a kid! They make the tastiest popcorn ever, I usually make it just on the stove with no popcorn machine, but if I see one at a garage sale, I just might pick one up. I so agree with your statement about using “white” popcorn instead of “yellow” popcorn. A couple of years ago I purchased some “white” popcorn at an Amish/Mennonite store and was floored at how good it tasted. Since that time I have been searching for “white” popcorn everywhere; for some reason it is very hard to buy in my area. In the past I tried using a “stir crazy” but didn’t like the moisture, that forms on the side, sticking to the popcorn. So, my solution has been to use a bacon splatter guard as a lid when using a pot on the stove. The splatter guard allows all the moisture to escape and the end result is a dryer, less chewy, popcorn. This is my first time leaving a comment. I enjoy coming to your blog from time to time and reading about your “thrifty” finds. I so love thrift stores and yard sales. We have an air popper that belonged to my dad and he’s “loaning” it to us b/c he wasn’t using it much anymore. I LOVE it! 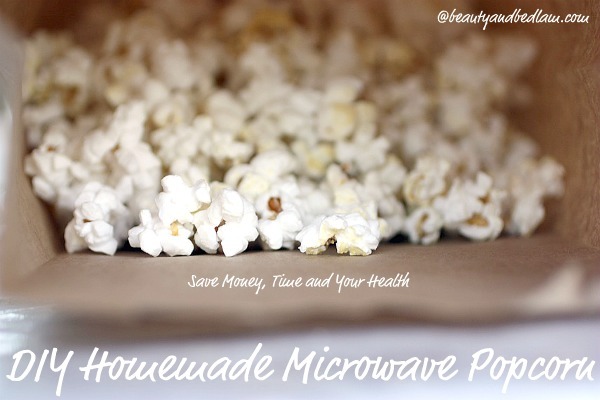 So much cheaper (and can be healthier) than microwave popcorn! I have not cooked popcorn at home in years. After reading your post I happen to notice white popcorn kernels. I bought some and brought them home and cooked them per instructions in a pan. It wa delish!! Thanks so much for reminding me of what a great inexpensive snack popcorn is. You always have wonderful ideas! I just bought one of these this past week. I need to run out and get all the supplies to actually make the popcorn now though. Our favorite flavored popcorn is chocolate. I cheat and use the microwave popcorn. Then, once it’s popped, open the bag and dump in a packet of hot chocolate mix. Shake until the chocolate is equally distributed and serve. My girls get their chocolate fix in a healthier way. We love “old-school” popcorn here – we never use the microwave stuff. Parm & garlic salt is our favorite besides just butter & salt. I’ve never used that kind of popper, though – I’ll have to start looking for them this spring! Ummm, where/how do you find white popping corn??? ?